Some kids see the reference desk solely as a place to ask questions about homework or books. Other kids pass by the reference desk without even glancing at it. And then there are those kids who see the desk as a place to hang out and talk to the librarian incessantly. Recently, one 11-year-old girl (I'll call her Maria, although that's not her real name) went so far as to make a warning sign for anyone who might dare encroach on her self-designated area of the reference desk. 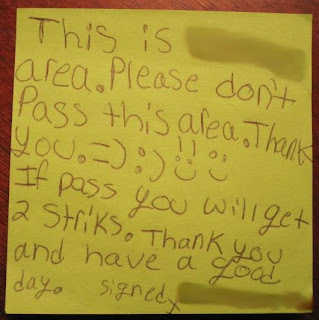 The smiley faces soften the threat. ﻿ Me: "So what happens after they get two strikes?" Maria: "We have a talk." Me: "Okay. What happens after that?" Maria: "Another talk. Then a poster." Me: "A...poster? Like, a 'wanted' poster?" Maria: "Yes. 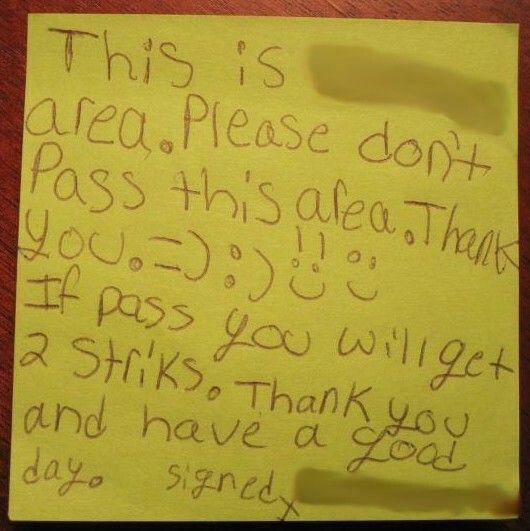 It will say their name and that they are not allowed to pass this area." Maria: "I'm just marking my territory. I always stand RIGHT HERE." She then proceeded to jump up and down in place next to the desk. Me: "You have to relax, lady!" Maria (thoughtfully): "Yeah, people say that to me a lot. But it's hard to relax." Maria recently tried to teach me how to make a lanyard bracelet. As I've said before, I have absolutely no talent or patience for crafty-type things. This picture above shows how far I got with mine (and this was with a lot of guidance from Maria.) My lack of lanyarding prowess was absolutely mystifying to her. Maria: "Come on. This is one of the easiest skills besides eating and tying your shoes." Me: "It's not easy for me! I've tried and I'm just not good at it." Maria: "I don't know what talent you have, but you have a talent." Me: "I can sing. I can't dance, though." Maria: "I can't dance either. I can't even do The Robot." (Because being able to do The Robot is the true marker of dancing excellence.) She then started dancing - some kind of fascinating Robot/Cabbage Patch hybrid dance - at the reference desk. When she stopped, she said, "Did I actually just do that? I pictured it in my head and it was AWKWARD." Hee. Maria also has the distinction of being the only kid to remember that it was my birthday when it occurred last month. (Not that I expect anyone to know or care about my birthday; I was just amazed that she DID.) 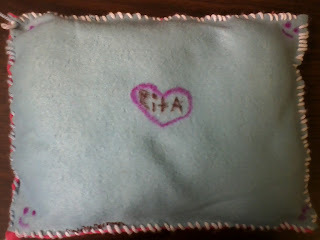 Maria took the time to make me a pillow in her summer camp Arts & Crafts class. When she gave it to me, she warned me: "Don't get your hopes up. I didn't make you a blanket." My dreams. They are crushed. Maria: "I just want you to know that the needle to sew the thread was SO BIG." Me: "Well, thank you for putting yourself in danger for my present. I love it." Maria: "Now you have a birthday to remember." I didn't even know what a reference desk *was* when I was a kid. I once had 3 girls hang out with me for a very long time at the reference desk (I liked them and they were quite cheerful but after a while I really did have other things I needed to do). Finally I had the brilliant idea to send them off with markers and paper with the assignment to make cards for my son in the Marines who was begging for letters. It was an assignment that made everybody happy. 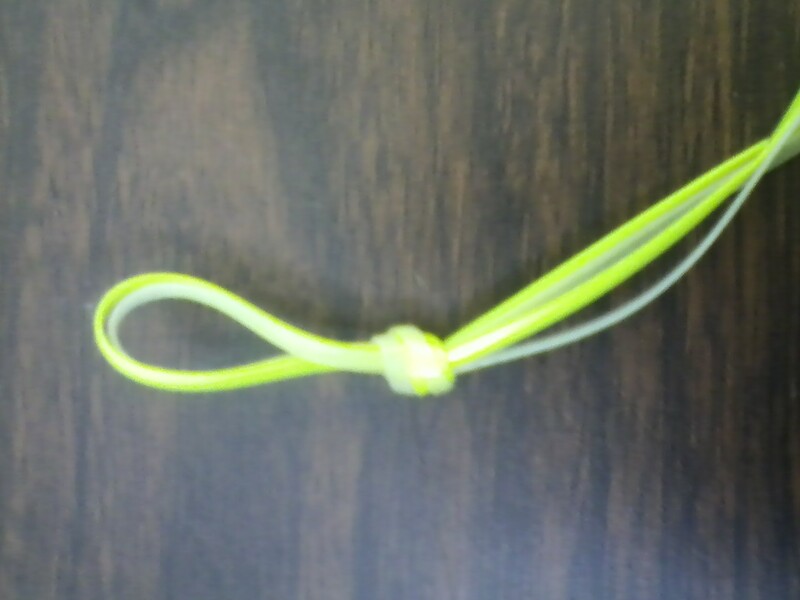 Yes, I often give them little tasks to do if I can't sit and talk to them at the moment - one girl made a rubber band ball, which is actually very useful! Oh, I have a Maria too! She's eleven and she's telling me about the changes she's experiencing because of Puberty. Good thing I'm in a school, she only have a limited time to talk to me. Haha. Oh, this is beyond sweet! The last hand-made gift I got was a heart-shaped note from my son that said, "to my Brown-Eyed Girl". It hangs in my cube at work, much to his chagrin. I want a pillow, too! 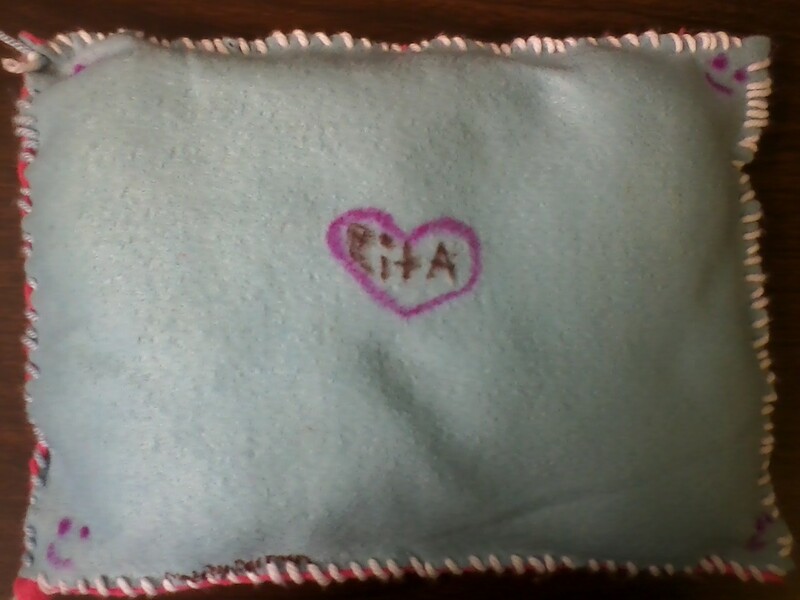 This is super sweet, maybe Maria has a sister who can make you that blanket. Unfortunately, my Marias are 24 year old comics students who want to talk about You-Tube videos while I'm trying to work.